Researchers from Brown University have assembled complex macroscale superstructures from pyramid-shaped nanoparticle building blocks. The research, described in the journal Nature, demonstrates a promising new way to bring the useful properties of nanoparticles to macroscale materials and devices. 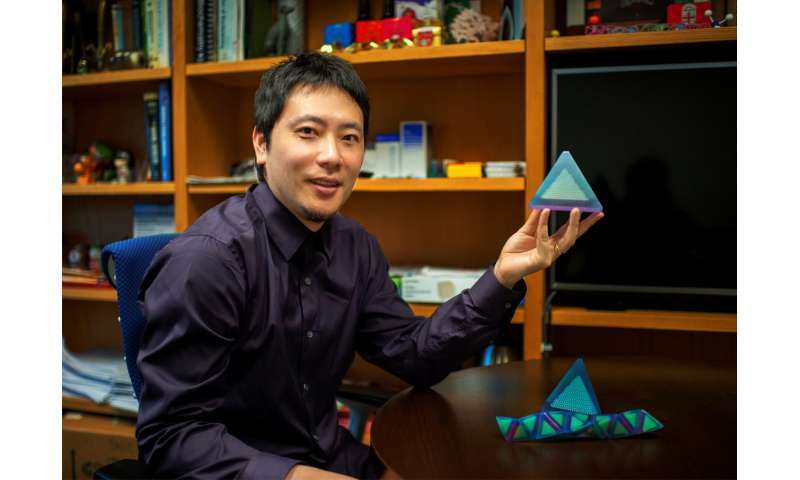 "There's been a lot of research in making superstructures from spherical nanoparticles, but much less using tetrahedral building blocks," said Ou Chen, an assistant professor of chemistry at Brown and senior author of the study. "Tetrahedra open the possibility of making much more complex structures, and the 3-D superstructure we demonstrate here is one of the most complex ever assembled from single nanoparticle components." Chen's research group developed the building blocks used in the study a year ago. The particles are quantum dots—nanoscale semiconductors that can absorb and emit light. Their tetrahedral (pyramid-like) shape has important advantages over spheres, Chen says, when using them to build larger structures. Tetrahedra can pack together with less void space than spheres, making structures potentially more robust. In addition, the particles used in the study are anisotropic, meaning they have different properties depending upon their orientation relative to each other. Spheres, on the other hand, are the same in every direction. "Ligands help direct the touching process that occurs when two particles come together facet to facet," said Yasutaka Nagaoka, a postdoctoral researcher in Chen's group and the major contributor to the project. "In this case, facets with like ligands attract, which offers a degree of control over how the particles arrange themselves." That's in contrast to isotropic spheres, which arrange themselves randomly. "Anisotropy adds to the complexity of the superstructures we can make compared to using isotropic spheres," Chen said. 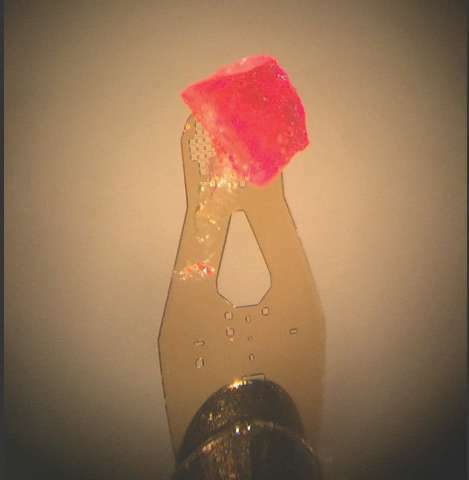 "It also gives us some power to control the atomic alignment of the particles in the supercrystals, which could give rise to interesting properties. For example, you can predict that alignment will give rise to better electronic properties because electrons hop more easily through the lattice of the superstructure." The 3-D supercrystals were particularly interesting, Chen says, because of their complexity and the interesting way in which they formed. The individual nanoparticles first formed ball-like clusters of 36 particles each. Those clusters then formed the larger superstructures. When the researchers characterized the structure in detail using X-ray scattering, they found that the atomic structure of the lattice was indeed aligned, as they had hoped. Now that they've shown a method for forming the structures, the next step is to interrogate their properties. "The quantum dot building blocks are interesting by themselves," Chen said. "They have interesting photon dynamics, which may translate into interesting optical properties in the superstructures. "We need to understand how to assemble these larger and more complex structures," he said. "I think these will be a bridge that will bring nanoscale dynamics into the macroscale and enable new types of metamaterials and devices." Anyone see the original "Andromeda Strain" where they mention using tiny geometric shapes to separate biochemical functions?